We manufacture marketing and promotional items as per our clients requirement. These are typically used for distributing new products launched in the market. 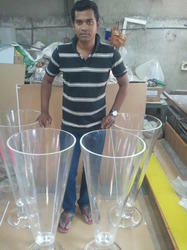 These items are developed as the clients requirement dpending on the artworks and concepts developed by them. By using our vast experience in this line of work we ensure that the client gets the best possible product keeping in mind all the constraints. Promotional display used to display beverage bottles. illuminated using 8 lights in the base with transparent acrylic cover on top. Looking for Acrylic Marketing and Promotional Items ?